So far today, I've done what I love best, a little sewing , a little baking. 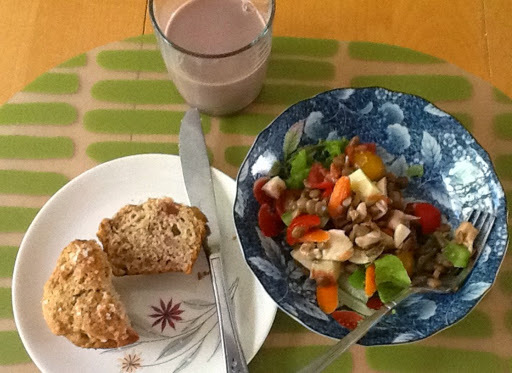 My tea with rhubarb muffins at a friends on Friday reminded me of my own rhubarb patch. 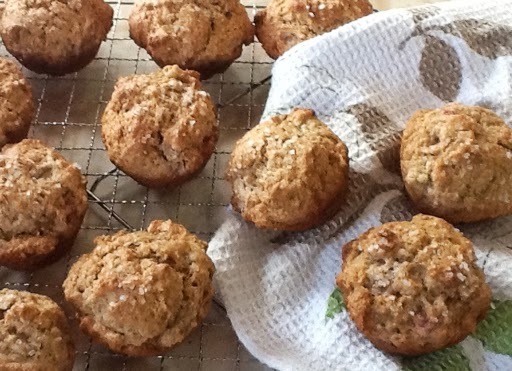 Yesterday, I picked a bunch, and after our leisurely breakfast over the weekend paper this morning ( I love the big Saturday crossword), I made rhubarb muffins and some stewed rhubarb. Here is the blog post where I found the recipe. It said to use either buttermilk or yogurt. I used half yogurt and half soured milk. I also eased up a bit on the sugar and didn't do the crumb topping, so instead added the cinnamon to the muffins batter. They are yummy! We had them with a lentil salad for lunch. And guess what was in the homemade dressing? Stewed rhubarb. I had time before lunch to get two of the black borders onto the quilt and I've just cut the last two. Do you cut yours this way following the centre measurement? My friend Sue taught me that. 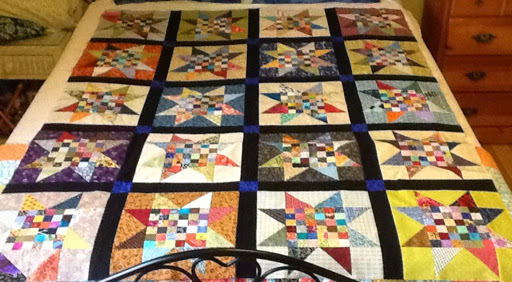 It helps to keep the quilt from becoming rippled as you add continuous borders. Sometimes you have to adjust a few seams and do a little easing but worth it. I managed to lose a tiny bit of just two star points. I'm not going to fuss about that. Now I'm resting with my feet up before getting ready to go to the golf course with hubby. The sun has been peeking in and out finally although it is very humid. I will be sweating and trying not to complain as its been so cool here. This morning I did some traditional quilting, adding the rest of my rows to my postage stamp quilt. It's not the best picture; I'll do better when it's all finished. 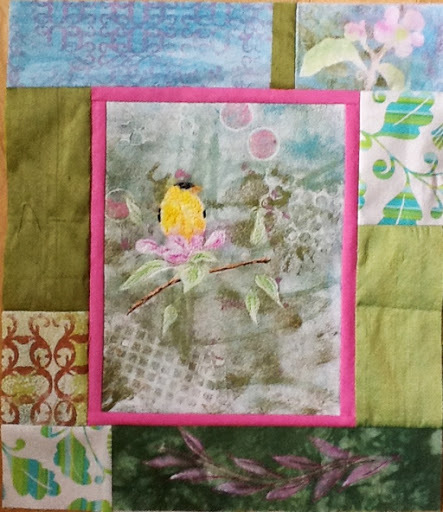 I plan to add the narrow black borders on four sides and then one final border. This long Canada Day weekend I plan to finish only the black borders. 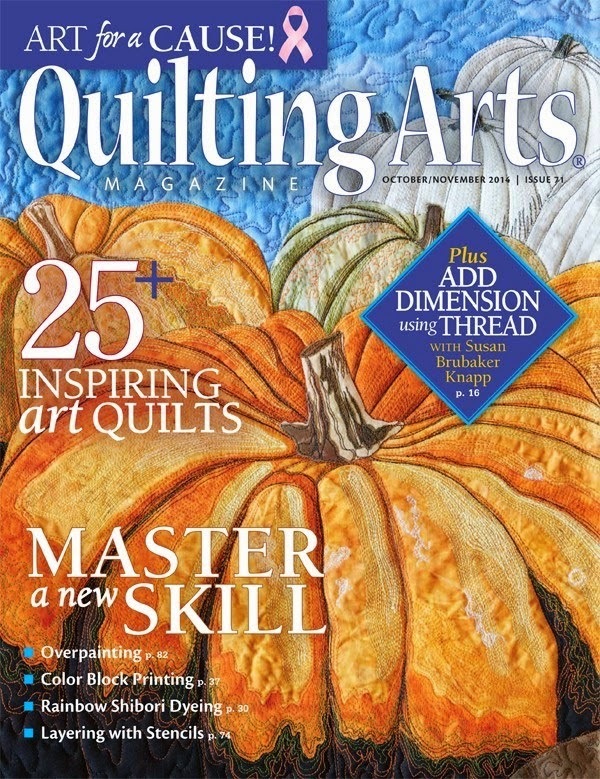 Then I will put it aside to take to my ladies quilting days or retreat in the fall. I can see that the 2 inch black border plus another 8 inch border still won't make it large enough for the queen size. What to do? I've got some time to ponder it. I think stars might be too busy. I do have a box full of various sized squares though. Perhaps some four patches interspersed in a wider black border. In my travels this summer, I may have a look for another border fabric. This afternoon after a quick errand, I went for a bike ride in the cool mist. I couldn't resist stopping to pick a few wild flowers along the wayside. I wrote Devil's Paint brush on my page but a blogger has written to say it is actually orange hawk weed. And so it is.Thank you, Gil! 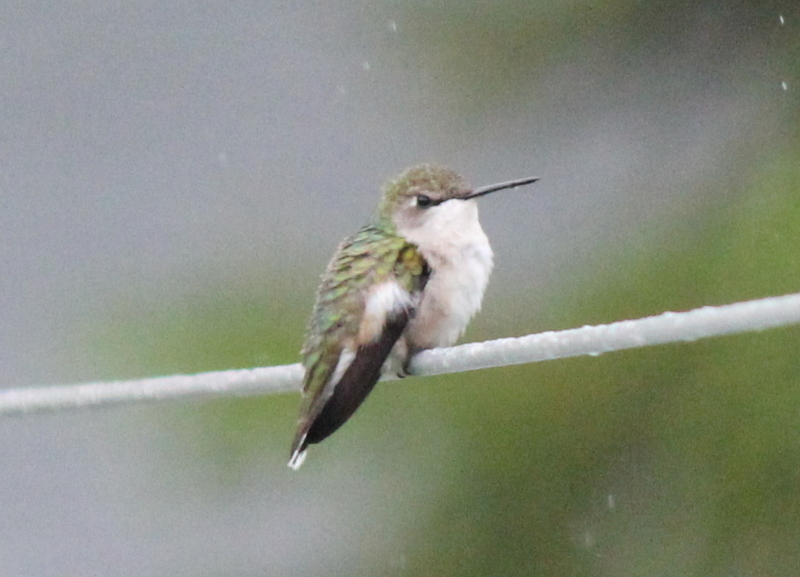 I'm hoping this string of rainy days will soon be coming to an end especially for Canada Day on Monday! I went for a walk along the NB Trail in between showers last night. It was too cold for the flies at least. I found this tiny pink flower all along the edges of the woods. Funny that I've not seen it before in all my years of walking there. 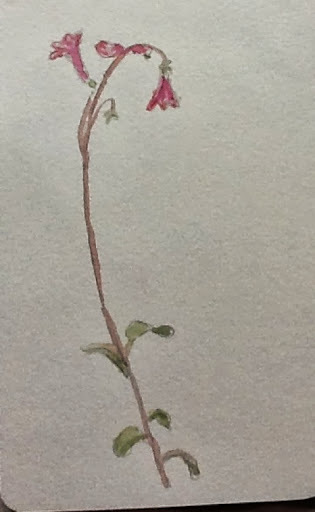 I did a little sketch of one when I got home even as the delicate bell shapes were closing. Today, my son left early this morning. It wasn't a great week for outdoorsy endeavours but it was nice to see him. I've just come in from errands and just finished slicing up zucchini for zucchini chips. I found the recipe here. I used a mandolin for slicing thinly so I'm hoping they'll be done before I have to go back out in two hours. The baked tofu looks good too and I just happen to have some. I might have to try that later. 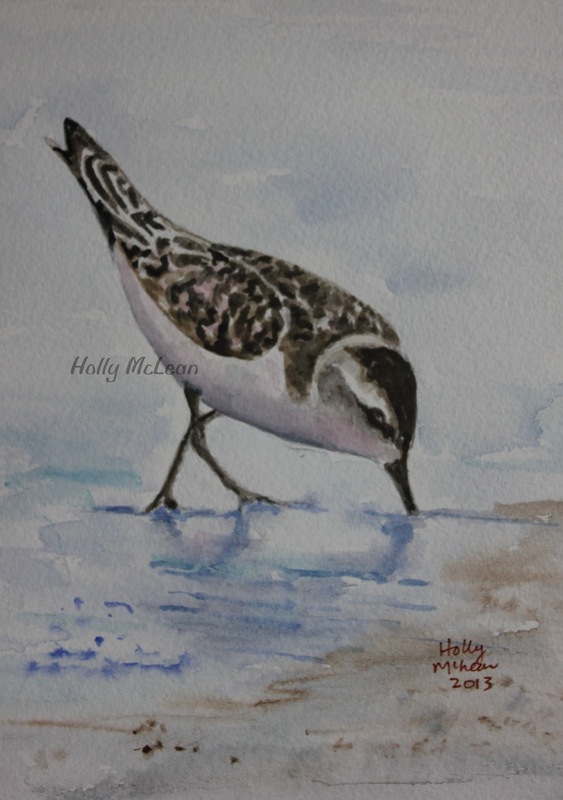 I finished up my 3 watercolors today of the plovers and sandpipers. With the permission of the buyer, I took pictures and imported them into my card program so I can make note cards with them. Here is the sandpiper. 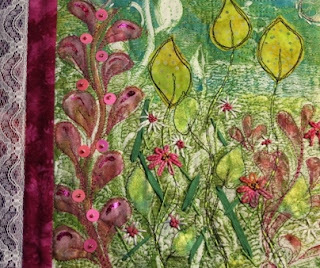 While I was at it, I made a card with a detail from my Midnight Garden quilt. You've seen it before but this pic came out quite nice with my good camera. Once I get the cards finished in my software program and get them printed, I will try to add some to my shop. And, as always in the summer, I am taking lots of bird pictures. I got lucky with this little fellow. Isn't he cute? This time of year there is always a lot going on between spending more time outside and having family visit. My youngest son is home for a few days and his fiancé will arrive tonight. The weather sounded rainy and unsettled for today but he managed a mountain bike run and I got a line of clothes dry. I cleaned and put some screens on the last couple of windows. It sure is late to be doing it but until this past weekend it was cool. 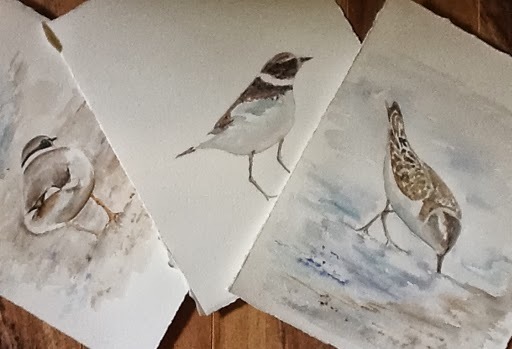 I've managed to get some time to work on my commissioned shore birds; two are plovers and one is a sandpiper, I believe. 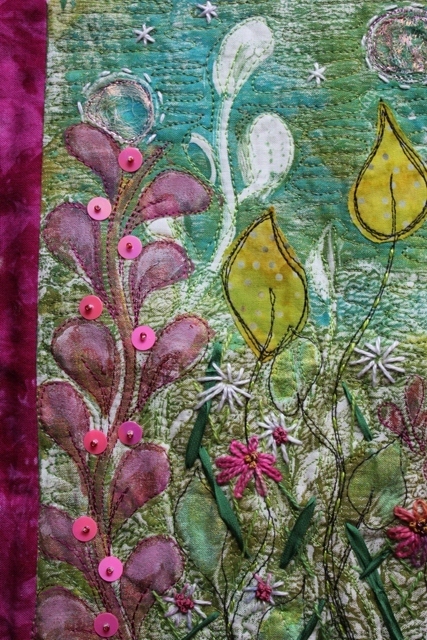 Then, I had a bit of time to add some green and pink free motion stitching to the blossoms and leaves in the border. I fixed the one circle where I melted the Angelina. I just want to add a bit more to the bird and then I'll sandwich it for quilting. I'm still pondering how I want to quilt it. I've seen some designs that I like and wondering if I could do it. I'll have to practice on some paper first to see how I like it. I think it will just be a mix of circles, wavy lines and a meandering zig zag to simulate leaves. 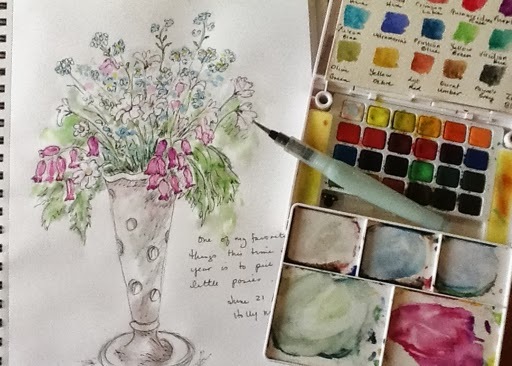 It's heading toward dusk, so the lighting is not perfect, but I wanted to share the quick little sketch I did of my wispy bouquet. The greens have not come out as bright as they actually are. When I say quick, I really mean it! I was practically scribbling. It was fun! It satisfied my wish for a little creativity today. Now I can go put my pj's on. I'd hoped to have time for sewing today but haven't. This morning I got early for a walk while it was cool. Then I had errands and groceries to do. I was so tired when I got home that I put my feet up and read. 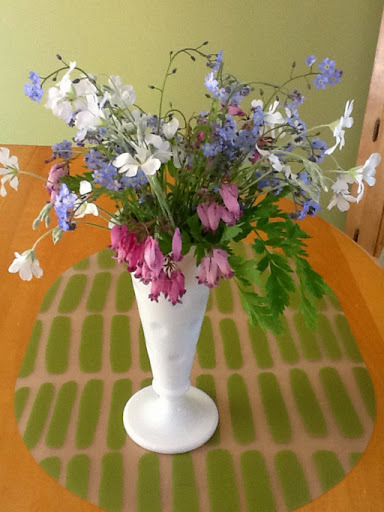 I did stop along the trail to pick a few forget me knots this morning and then added some flowers from my garden. I got my household chores out of the way this morning as I often like to do and even had time for a visit with friends at the local coffee shop. 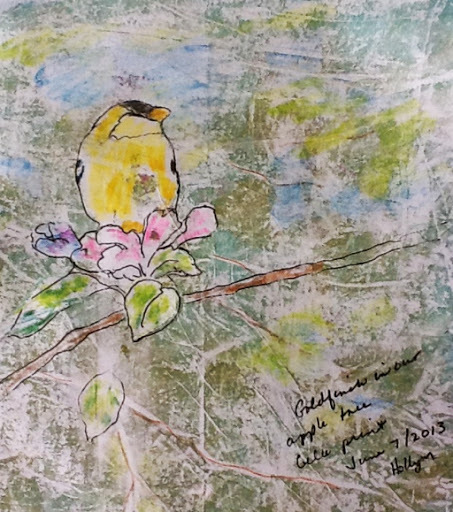 After lunch, I knew my goldfinch was waiting for borders and I was anxious to get to it. I do believe that piecing random borders made up from an assortment of fabrics and painted fabrics is my favorite thing to do. 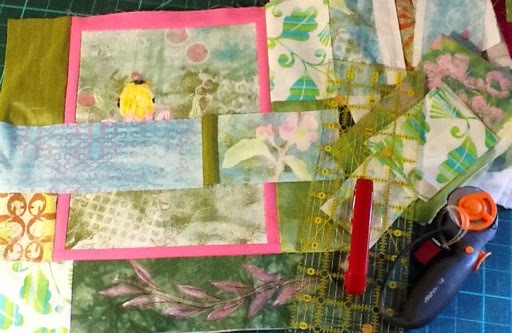 I pulled out some solids, some silk, and some of my screen and Gelli printed pieces and started cutting. I get so absorbed in this process. Here I took a picture once I was almost finished and had started to clean up. I should have gotten one amidst the process, but of course I was too absorbed. I managed to get the last piece on just in time for snack break. I do enjoy my tea and knitting time too! The plain greens are silk. I'm trying to decide if the green stamped fabric on the bottom is too dark. I think it's OK but will revisit tomorrow. Also, I managed to melt the Angelina fibre that I applied to the circle on the left. I'll have to redo that. This is the back of a baby sweater I've just started. It's a lovely cotton yarn that was gifted to me by a friend who was cleaning house. Lucky me! I've been having a quiet Monday; did some housework and went for a walk. It's a bit gloomy out but it wasn't raining. Then, I wanted to get the binding on my garden hanging so I could take it to the shop with me on Wednesday. I did take some better pictures with my good camera but for this post I used the I Pad. 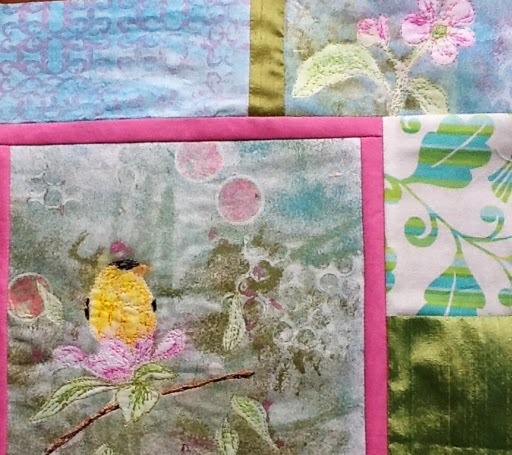 I puttered about a bit in the studio choosing fabrics to border my goldfinch with so i can get to the quilting. I'm waiting for the paint to dry on one of the fabrics so I'll get to that later. I've got tea steeping as I write this. I'm going to go make a cup and sit with my knitting. 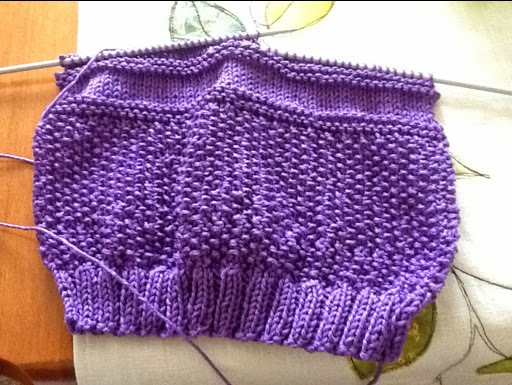 I've just started a baby sweather which I'll post once o get going on it. I hope your having a good Monday too! Today, I'm guest posting at the blog, And Then We Set It On Fire. I've written a bit of a synopsis about my Gelli printing. I hope you'll check it out. This gold finch piece is one of the last things I posted about as I've been working on it this week. 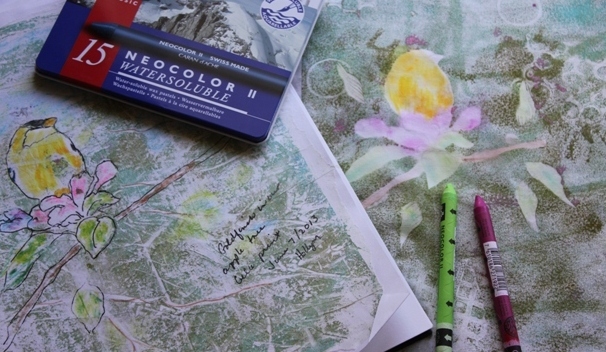 On the left is a deli paper print that I glued into my sketchbook and on the right is a fabric print that I've colored with my Neocolor II crayons. Here it is as it sits currently, ready for sandwiching. Today, I'm going to get some clothes washed and hung out, maybe tend to my garden or at least walk around it and then I'm going to do a few hours in the shop at the waterfront that carries my things. I'm working on these for a friend's cottage. I feel a little outside my comfort zone as I don't do very many 'serious' watercolors. Mostly, I just play in my sketchbook..
She wants a series of three, and she will mat them and frame them, assuming I finish them to my satisfaction. I finished up this little piece and decided it didn't need much in the way of a binding. I remembered a tutorial I read at marvelesartstudios for her version of a faux piping and decided to give it a try. Do you see where there's just a little peaking out here and there? That's how it's supposed to be. I think it works great on the gentle curves of this piece which measures about 8 3/4 by 10 inches. It's all done done except the loop hook in the back. Now I just have to decide if I should list it on line or put it in the shop downtown. I did a bit of everything today. This morning I had a short bike ride, met friends for tea, and potted up a few more plants. 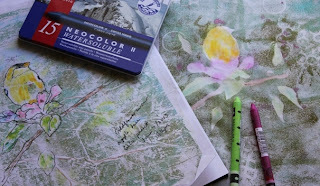 After lunch, I did some sewing and worked on a blog post I'm doing this Saturday as a guest blogger. I'll link up when I post. 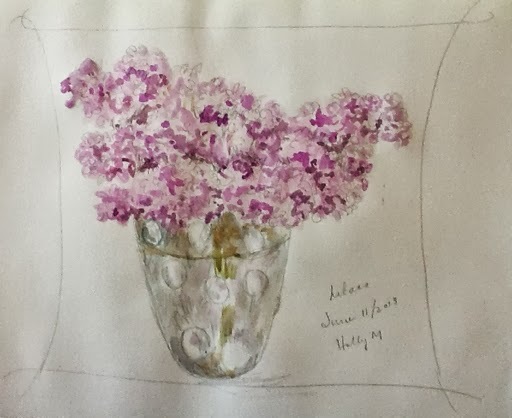 This evening, I've been listening to the goldfinches sing while I did this quick sketch of some of my lilacs. I was aiming for loose and sketchy so I set the vase across the room. It has been a nice weekend (not weather wise). Yesterday, a friend and I took the day to do an art studio tour which we both really enjoyed. 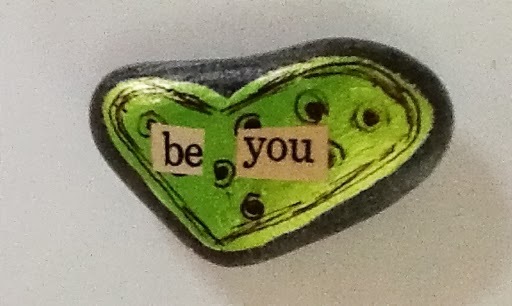 My only purchases were a couple of notecards and this frig magnet painted on a small stone by my friend Nicole Boudreau. The color and the message suited me. 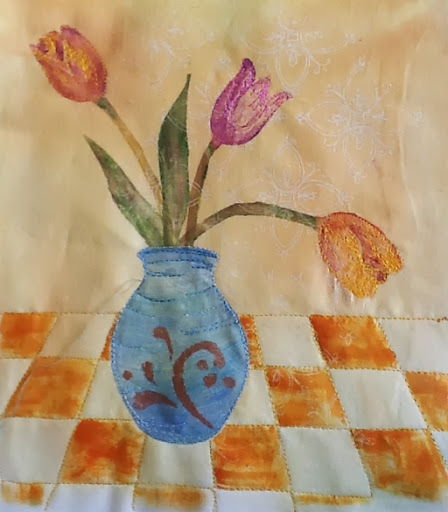 We were out visiting in laws today and then I squeezed in a bit of studio time to finish most of the stitching on the tulips. It's just about ready to sandwich and quilt. 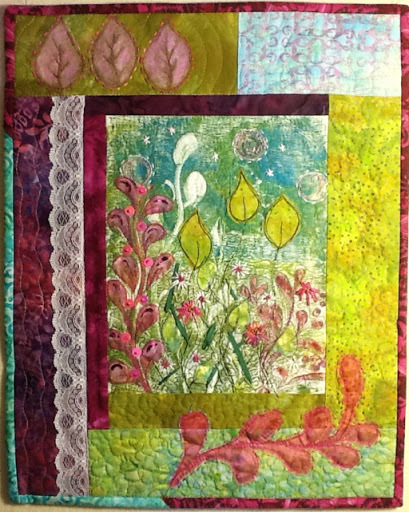 I'm still thinking of stitching on some writing, but would only do it after the quilting. I'll see then. Now, I'm starving! 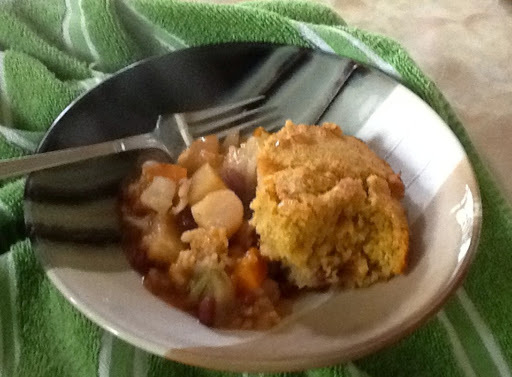 I'm going to dish myself up some baked veggie stew with the cornbread topping that I just took out of the oven. I potted up a few flowers and a tomato plant this morning while listening to the sweet song of the goldfinch. By the time i was starting to exude a bit of sweat while planting the rest of my seeds, some carrots and some nasturtiums, I was rudely interrupted from my reverie by some pesky little flies. My carrots won't be growing in any straight row this year! I was practically flinging them in my haste to escape. This is a ghost print on wrinkled deli paper that I made the other day after printing on fabric. I glued it in my sketchbook and filled in with colored pencil. I'm quite intrigued with the texture of the wrinkles which echoes the tree branch lines. I'm thinking of ways to produce it on cloth. Now I must go change for my Friday lunch date followed by tutoring this afternoon. This morning, as I do every Wednesday, I went to the spa for my lap swim and sauna. It is a saltwater pool and kept quite warm so its very soothing. The sun has finally been shining this last couple of days, so I took a little walk around the yard to examine all my plants. The lilacs and apple blossoms are just out. 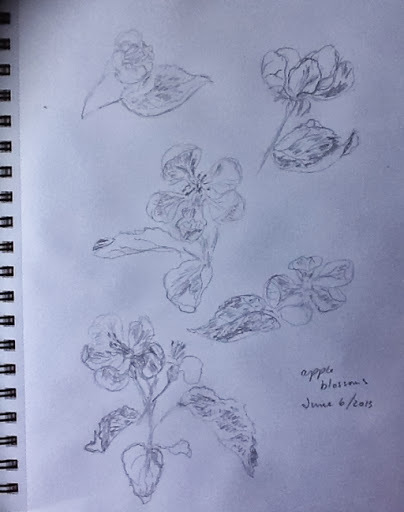 I snipped a piece from the apple tree to use as a model for sketching while I had lunch. Next I took my tea to the computer and went looking for a photo I had taken of a goldfinch sitting atop a cluster of blossoms. 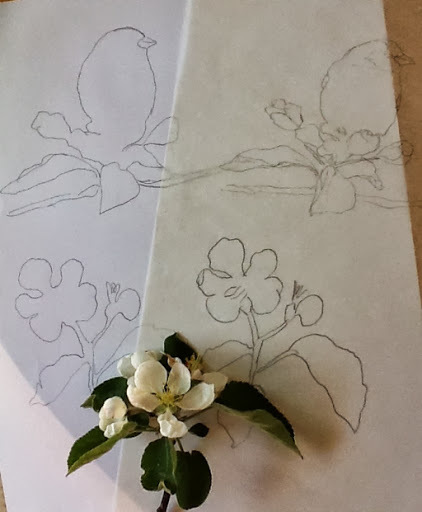 I copied it onto tracing paper and then drew the outline on white paper. This I cut out to use as a mask in my printing. Here is one of the pieces I did. 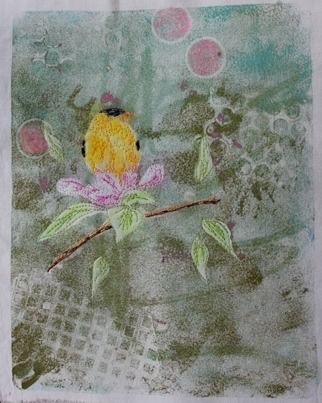 I got four or five prints before the paper tore while trying to lift it off the Gelli. Some that are not quite as intricate will last longer. The next step would be maybe more layering, painting the bird and then stitching. First I have to finish the piece I'm working on! I don't have much to show today. I was cooking for a friend in need and then after lunch, I decided to finally have a go at making a playlist on my I Pod for walking. I've had one for a couple of years and use it in the dock in my sewing room. I just recently got earbuds. It took me an hour to get that settled and then I had to walk! 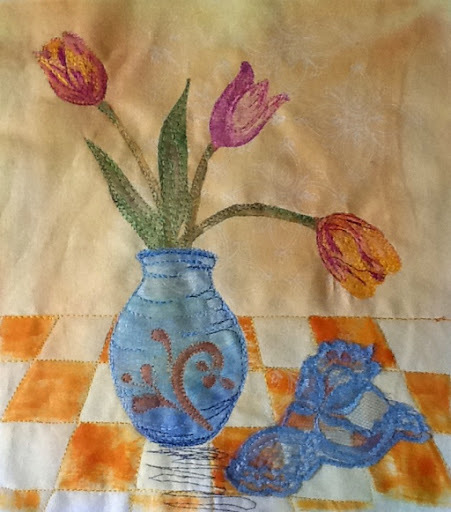 I was anxious to get a bit of the stitching done on my printed tulips, so I managed to squeeze in a bit. Right now for this part I've got it backed with a heavy stabilizer. When I get to the actual quilting, I will sandwich it with batting. I'm so used to my pieces being busy that this seems like it needs something. I may experiment with a scrap of lace and a written word. I do have a word in mind but would take suggestions. After making a rhubarb crumble first thing this morning, I starting cutting out fun foam tulips. Not having any thick foam left to stick them to, I used cardboard. In the picture below you can see where I laid a paper mask over the vase so I could print the tulips. After it was dry I then decided to paint some checks around the vase. I used a chalk pencil but it doesn't seem inclined to come out in places. I'll have to hope to cover it up with some stitching. If you look very closely you can see one where I moved a line. It's not exactly where I want to stitch so we shall see how that works out. I keep thinking I want to do something a little less realistic, but I can't seem to help myself. 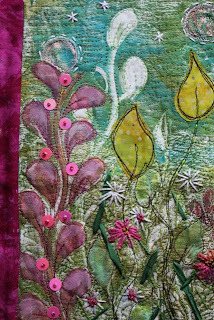 Next, I can't decide if I should back it and start stitching or add the borders first. Of course I want to dive into the stitching now! It's been another grey drizzly day here. It s getting tiresome. Showers are forecast for tomorrow. I am hoping to get out in between to do a bit of planting. I wasn't home for long today. 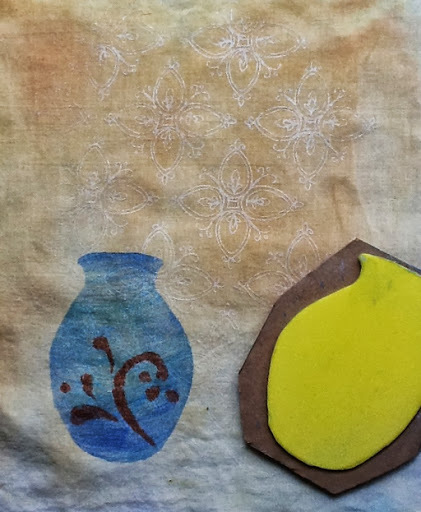 In between I stamped a vase shape onto a piece of fabric that was screened with a white and painted with a gold transparent paint. The design on the vase was done by masking off part of one of my homemade stencils. 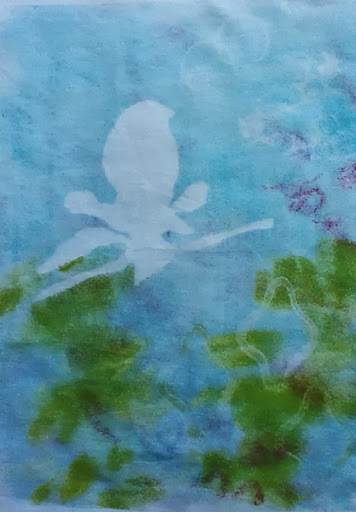 Originally, I planned to make tulip stamps for the vase but now I'm thinking maybe lilacs. Mine are half opened. I'm thinking of pressing a couple and trying to print with them. i use old phone books to press plant materials. Let you know how that goes in a few days. I was at our waterfront shop today, Chal Baie, where I did a little more on my garden piece. I'm sure some of you are tired of seeing it. 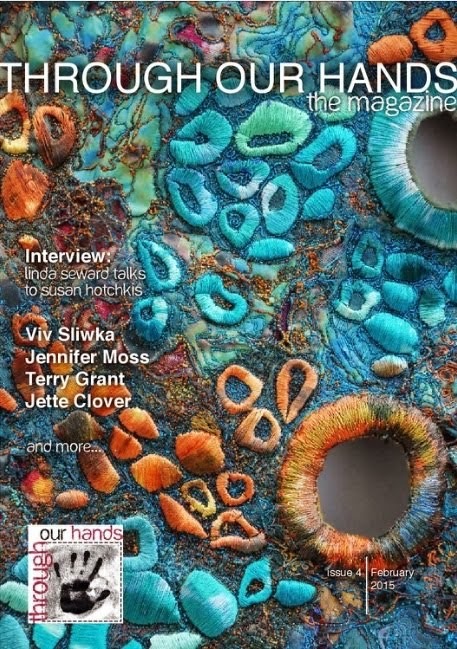 Hand work is a slow process though and I haven't done any machine sewing for a while. I've done a lot more hand stitching on this than many of my pieces. It just seemed to ask for it and I've been in the mood. 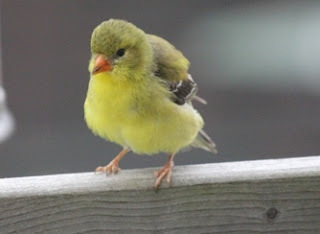 It is also the time of year when I start showing more bird photos. Our hummingbirds appeared at our kitchen window this week summoning us to put out the feeder which we promptly did. I had no idea they would return to the same house and feeder. Remarkable! It's another rainy weekend here. You can see some of the droplets in the photo above.We've canceled golf again. at least I have creative things like taking pictures through my windows to keep me busy.